This app is a cracking app to have if you want to learn about the American Revolution, which the app states was a fight against injustice and tyranny, as well as for freedom. At the beginning of the app there is a great introduction with music and images before being given four options, which includes a timeline, photo gallery, quotes slideshow and a video summary. Having the option of quotes, pictures and videos being displayed by themselves is different from some other Touchzing Media app books. I like this as every interactive book that I read from Touchzing seems to be slightly different in a unique way. The photo gallery is like a virtual desk, where you can manoeuvre the pictures around on a desktop and if you want to look at one closely you just tap on it to bring the picture up to full size.Â I really liked the quotes gallery with the great pictures in the background fading away. The app goes into more detail in the timeline, but if you are like me and want an overview of the American Revolution before taking a look at each individual event, then I’d recommend looking at the video summary beforehand. You can reach the photo gallery, video summary and quotes through the timeline also. This app is very simply laid out and easy to make your way around in. On the timeline you can either click on the text to find out information, which brings up an interactive photo set also, or you can click on the featured image for that particular event. To wet your appetite, here is a brief overview of the American Revolution and if you are interested in this crucial event in history, this app will educate you on all aspects of this revolution leading to freedom. 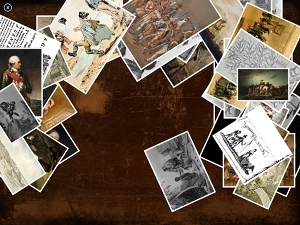 In this app you can learn about the American Revolution in a lot more detail as there are sections on The Proclamation of 1763, The Sugar Act, The Virginia Stamp act, The Boston Tea Party and The Boston Massacre for instance and many, many more events. The American War for Independence, known better as the American Revolutionary War, was fought between the 13 British Colonies in North America and their mother nation, Great Britain. It lasted for eight years, starting in April of 1775 and ending in September of 1783. It changed the fate of the entire world and ended in the founding of a nation that has become one of the earthâ? ?s biggest powerhouses. Although the actual war started in 1775, the era of revolution actually started years before in 1763. It started with strict laws by Britain that had even stricter punishments. This created tension between Britain and her colonists. These tensions came to a head after the Tea Act was passed in 1772. In response to this legislation, a group of colonists, led by Samuel Adams, dressed as Native Americans and ambushed ships carrying tea and threw the cargo into the harbor. This became known as the Boston Tea Party. After three more years of rising tension, Massachusetts was eventually labeled a rebel and the Battles of Lexington and Concord happened on April 19 of 1775. By August, King George III declared the Americans to be traitors to the British Crown. The British Empire had a clear advantage. They were an established, powerful nation with a well-trained army and navy. They also had a slew of allies that supported them. However, the colonists had assets of their own. First of all, they were led by George Washington, argued to be one of the most brilliant military leaders in history. They also had the aid of France as well as other assistance from British commanding errors. There were several times when the British almost overcame the Continental Army. However, significant defeats at Trenton and Princeton, New Jersey in 1776 rallied the patriotsâ?? spirits and their victory at Saratoga, New York in 1777 stopped the British from advancing in Canada and led their French allies to intervene on the rebelsâ?? behalf. In 1778, the fighting moved south. Although the British managed to capture Georgia and Charleston, South Carolina and defeated the Americans at Camden, the patriots stuck together. They disrupted supply lines and aggravated the loyalists, causing the British to fail to control the rest of the South. By 1781, the colonists and the French had defeated the British in Yorktown, Virginia. This was the last major battle and decided the fate of the war. In 1783, the leaders met in Paris and signed the Treaty of Paris on September 3. A war always comes with casualties. 7,200 Americans died in battle and 10,000 died from disease and another 8,500 died while in British prisons. On the British side, 1,240 were killed in battle and a shocking 18,500 died from disease. This is not even counting the casualties from their allies and those that deserted. The financial costs were equally staggering. Beyond the human and the monetary costs, however, is the result of the American Revolution. 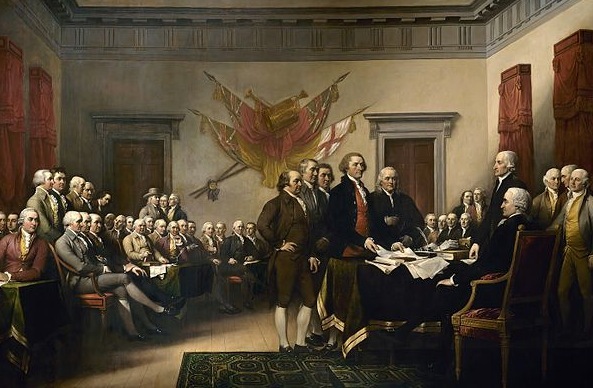 The United States were founded and the people gained their freedom. This war was revolutionary in many ways, and it will forever remain in the history books as a war of utmost significance. Brief Overview of the American Revolution by writerÂ Rebekah E. White. The app is easy to navigate around and is a lot more interesting than just a plain book to read. I had a lot of fun as well as educating myself more about the events surrounding the American Revolution. So far, all of Touchzing Media’s interactive books that I’ve read have been a joy to read. This app is well worth investing in for the knowledge that you gain and to make self education a fun experience. I can’t think of many improvements in this app as it is a solid app with a lot of information contained within. One thing that would make the quotes slideshow more poignant would be to put some touching classical heartfelt music into the background. This would heighten the mood and impact of the quotes. Just a suggestion for the developers if a future update is planned. As usual, Touchzing have created yet another brilliant app to make learning fun as well as interesting. A class ‘A’ app.